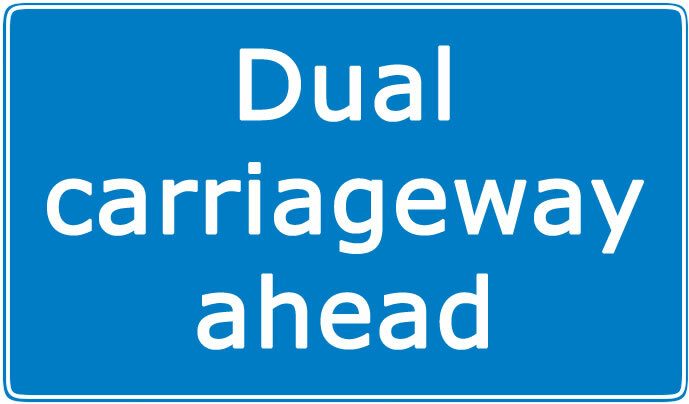 A dual carriageway is defined as a carriageway where vehicles travel in opposite directions and are separated by a central reservation. They can be an intimidating prospect for learners, as there is usually the issue of lane driving and also travelling at higher speeds. 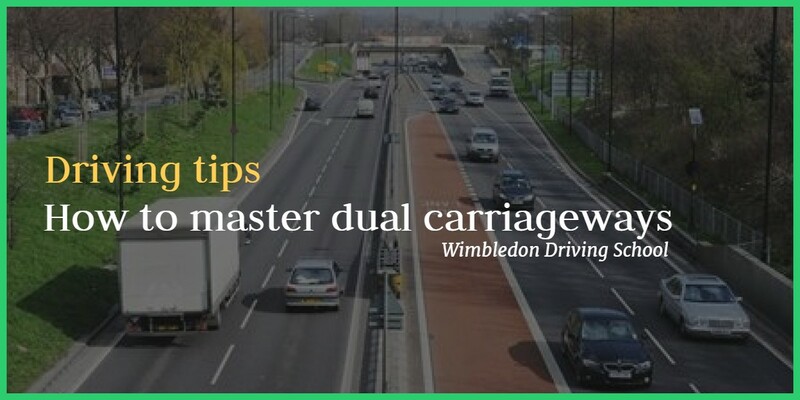 Whether you are learning to drive, studying for your theory test or just trying to perfect your knowledge of safe driving on a dual carriageway, this guide offers some great tips on mastering dual carriageway driving. The first scenario is fairly straightforward. You might see a sign like this. In the second, if you are turning right you will need to consider the depth of the central reservation. If its depth is sufficient to protect the full length of your vehicle, you can treat the two sides of the carriageway as two separate roads, since you can wait in the centre for a safe gap before emerging onto the second half of the road. If the central reservation doesn’t have sufficient depth, however, you will need to wait for clear space on both sides of the road simultaneously before emerging. If you are entering via a slip road, you will want to use a responsive, flexible gear (you don’t use the higher gears until you are settled into the road – then you will want to drive in an eco-friendly manner). This way, you will be able to match the speed of other vehicles on the main carriageway as quickly as possible. By using a more responsive gear, you will also be more able to avail yourself of gaps that would be too difficult in a higher gear where acceleration power is flat. Maintain large gaps between yourself and other vehicles as you enter, particularly if you are not up to speed right away. Check – check interior and right-side mirrors, then signal. Confirm – quick glance to the right. This is not a full blind spot check as the car is moving at speed; it is a chin-to-shoulder check. Change – move into the lane if it is safe, having given others plenty of time to react to your signals. Cancel – ensure any signal that was applied is cancelled, as leaving a signal on can be misleading. Once you are on the dual carriageway, take a moment to settle into the speeds other drivers are travelling at. Even HGVs can (and will) drive at 50mph in a 50mph restriction when conditions allow, so give them time to reach their speed before making any lane changes. Moving to the right to overtake, only to find that cars in the normal driving lane are travelling at the carriageway’s maximum speed, will mean there is no need to be in the middle lane. If, after assessing the traffic, you are travelling at a slow pace, you may consider overtaking. 1. Look forward as far as your eyes can see and follow your eyes with your hands. 2. Check wing mirrors to ensure equal space between lane markings. 3. On carriageways with high traffic volume, the path driven by other vehicles creates a polished track on the ground. This track can be a helpful tool for finding position. 4. Observe the positioning of other vehicles. If you are in lane 2 and notice a faster moving vehicle in your mirrors, it might be best to return to lane 1 and allow that vehicle to pass before coming back into lane 2 to continue overtaking. When overtaking a slow-moving vehicle, you can warn them by flashing headlights if there is a worry they have not noticed you. This is usually preferable to the horn on dual carriageways or motorways. Other drivers might try to signal that either they are about to become a hazard, or that there is a hazard ahead by flashing hazard warning lights, so be aware of all vehicles around you. When altering your position, don’t just check your mirrors, give a signal and move instantaneously; remember that signalling is part of the information phase of IPSGA, and on a faster moving road it is vital that you give people some time to respond to the information you give them. When considering overtaking, assess the time and space it would require and consider if it is even necessary. If you are close to the speed limit, overtaking other vehicles that are close to the limit might take a long time. Furthermore, if lanes 2 and 3 are quite congested then changing lanes may not even enable you to overtake. If you see an HGV ahead, remember they are limited to 60mph on dual carriageways where national speed limit applies. If it is safe to do so, you will probably want to overtake them. 3. Consider an ‘escape route’, meaning a change of lane to the right. In the majority of instances, simply adjusting your speed is the simplest action. But it is good to have a ‘Plan B’ whereby you move to the next lane to avoid a stream of cars entering the carriageway. Obviously, it must be established whether it is safe to do this first. If you see a vehicle tailgating a slow-moving vehicle, be aware they might choose to suddenly change lanes and overtake. Sometimes cars will change lanes late from lane 3 to lane 1 in order to take an exit. They might have realised their exit is coming up very late and try to take the turning unsafely. For this reason, it is best to anticipate this possibility. Avoid driving parallel to other vehicles near exits in order to avoid coming into conflict with cars altering position rapidly and without due care. Defensive driving also requires managing space through the 2-second rule as well as ‘Tyres and Tarmac’ when queuing. ‘Undertaking’ refers to the process of moving ahead of vehicles that are to your right. It ties in to the extra care you should take when dealing with drivers of foreign vehicles. People are less able to see what is on the opposite side to where they are sitting. Undertaking increases the risk that the driver of the car you are passing won’t see you, and overtaking a foreign vehicle means there is an increased risk of the same thing. It is dangerous to drive in the blind spot area of another vehicle, and it should be avoided unless there is no other option. Signs for an exit to a dual carriageway usually appear at 1/2-mile distances, but can sometimes be at 1/3-, 2/3- or 1-mile from the exit. If you are on a motorway, you typically get a 1-mile warning and a 1/2-mile warning. When you reach the 1-mile sign, you should transition into lane 1 before reaching the 1/2-mile marker if possible. Rushed lane changes are difficult, and you will need to be in lane 1 to take the exit. Begin signalling to leave when you are at the first countdown marker around 300 yards from the exit, and avoid slowing down on the main dual carriageway. Instead, decelerate on the slip road. Plan ahead if your exit is a roundabout, to ensure you are in the correct lane. Take care to adjust to the new speed limit – 40mph will feel very slow if you’ve become accustomed to travelling at 70mph.